My mum can’t watch horror films. She just can’t. Even if they aren’t that scary. Even if they are horror-comedies or versions of stories she’s heard before. She can’t even be in the same room when they’re on – even if nothing actually horrific is happening. It turns out that – in her youth, while an au pair in Belgium – one of her friends convinced her to see a movie playing in the local cinema. A film about a family in a hotel over the winter, starring Jack Nicholson. That movie scared her to death, and has arguably scared her ever since. That movie is – if you haven’t gathered from the title of this post and the plot description – The Shining. The horror genre has very few bona fides classics. Certainly a lot fewer than other genres. Some may argue that that’s due to snobbishness amongst film critics, or some may argue it’s simply because horror is generally treated as low budget low-brow fare by the studios which produce it. I’m not a film historian, so I can’t really debate the merits of either view. However, The Shining is perhaps the classic of the horror genre. Sure there are all manner of other notable horror movies – The Omen, The Exorcist, The Silence of The Lambs or even as far back as Nosforatu if you want – but I think The Shining may be the finest example of a horror movie ever made. Sure, it’s set pieces – an axe-weilding, prime-time quoting Jack Nicholson in a frosty hedge maze or at a typewriter – have enter the popular lexicon, to be imitated and spoofed time and time again. But that doesn’t diminish the film’s power. Like all truly fantastic horror movies, it taps into a raw and fundamental fear: what if those who were entrusted to protect us turned against us? 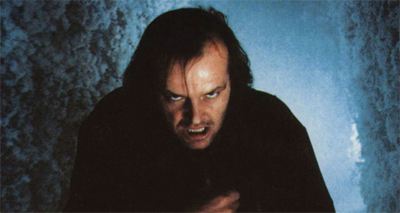 Jack Nicholson as Jack Torrence isn’t just one man, he’s the provider for the nuclear family we witness in the film. He earns the money, he takes care of them. When Danny sees something in Room 237, it’s Jack who investigates this potential threat. It’s arguably no coincidence that he is only Danny’s stepfather – classic fairytales, again written as allegories for primal fears, frequently feature the destructive power of an unnatural entity within the family unit (wicked stepmother, ugly stepsisters, a wolf in granny’s nightdress). It’s no secret that Stephen King himself has a love-hate relationship with this movie and his main bone of contention was the casting of Jack Nicholson in the title role. His argument was that the movie was about an everyman – he even suggested Jon Voight (!) for the lead – and the suspense over he goes nuts. Basically, he contended, the audience wouldn’t doubt if Jack Nicholson was going to flip out and become homocidal, but when. There was no suspense if the audience knew he was going to wig out. I say this with no respect to Mister King – who doesn’t get enough credit for his work, to be frank – but that completely avoids the central point of the movie – as distinct from his novel. “You’re the caretaker, sir,” the spirit of the former caretaker assures him at one point, “You’ve always been the caretaker.” The film suggests a cyclic spiritual nature to Jack’s journey in the film (it’s really handy both the actor and character have the same name). The movie suggests that Jack Torrence belongs at the hotel. He was always going to end up here – perhaps by forces more powerful than human nature. And there are forces more powerful than human nature at work here. It’s been a while since I read King’s novel, but I recall it being a lot more thorough on the history of the establishment. It is also a lot less ambiguous than the movie on the issue of ghosts – for example, the novel explicitly states that the hotel was built on an Indian burial ground, but the film only hints at the possibility with a throw-away line about Indian attacks during construction of the hotel. Still, Kubrick’s screenplay retains some evidence that what occurs is not strictly psychological – the climax relies upon direct physical intervention by the hotel and Danny’s titular ability remains (though in more subdued form). The hotel is – in some intangental form, at least – alive and it wants to reclaim what belongs to it. All that said, it is worth considering that in every supernatural scene there is a mirror present (though Kubrick constructs a lot of non-supernatural shots with mirrors as well), indicating that at least some of what is occurring is happening within Jack. In one shot he reflection is replaced with a phantom barman, dressed in the same colours and smirking, while the camera lingers on jack – making it not unreasonable to infer he is talking to himself. Kubrick makes the hotel brilliantly unsettling (particularly at the climax, featuring a cameo from what looks like the cowardly lion from The Wizard of Oz). The film itself is stunning – particularly in High Definition, considering its age. Kubrick, as ever, has an eye for the visual construction of shots and for piecing things together (even the colour construction of scenes (right down to the patterns in the furniture – which I believe are Native American patterns). The setpieces are equally impressive, even if you’ve seen them all before or assimilated them from pop culture (“Strange, the blood usually gets off at the second floor”). I’ll be honest and concede that I am not a huge fan of the vast tracts of Kubrick’s work. Don’t get me wrong – I love 2001: A Space Oddyssey – but I think that his style tends to be very cold and distant. Here, that works perfectly. It’s also worth pointing out the fantastic score – structured around pulsing and beating – creating the impression that the hotel itself has vital organs regulating it’s functions, as if it is alive. Aside from that, the score manages to perfectly evoke the fear and terror of the experience with tightly-pulled strings ticking away. This remains a film I would love to see on the big screen. Haunted hotel stories are a dime-a-dozen. King himself has even written more than one (the other being the passable-but-not-spectacular 1408). This may be – just may be – the best of those type of stories ever told. And it’s not because of the hotel or the fancy editting or the ghosts, but because it is fundamantally about one of the scariest experiences imaginable: a parent hunting his own family with an axe and an insane look in his eye. The fact that that parent is Jack Nicholson doesn’t hurt none either. Just happened to watch the film and to look if you wrote sth about it. What I found intriguing is the “postmodernism” of this “classic” horror movie. Nicholson’s character is a writer, his wife a horror film addict, his son learned about cannibalism in TV. The family relives sth that happened before, and the rationalist-modernist approach (a hotel in the mountains against the odds of nature and buried history) is clearly turned upside down. Funny to read about King’s dislike of the casting choice. Indeed, Nicholson looks crazy from the first scene on. This is an old review, in my defense! Wow, nine years old. Makes me feel really old.